The "elbow pads" seen being worn on the uniforms are, in fact, white Markwort volleyball knee pads that have been dyed grey. Unfortunately, the company has discontinued production of this model, forcing fans who make costumes to find similar alternatives such as "Defender" and "Pro Series 3 Pc." 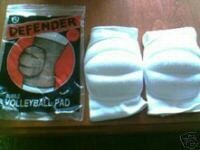 brand volleyball knee pads.